People sing Argentina’s national anthem during a demonstration for May Day, Buenos Aires, Argentina, May 1, 2018 (AP photo by Victor R. Caivano). BUENOS AIRES—Last October, Argentine President Mauricio Macri celebrated the triumph of his Cambiemos, or “Let’s Change,” coalition in midterm legislative elections. 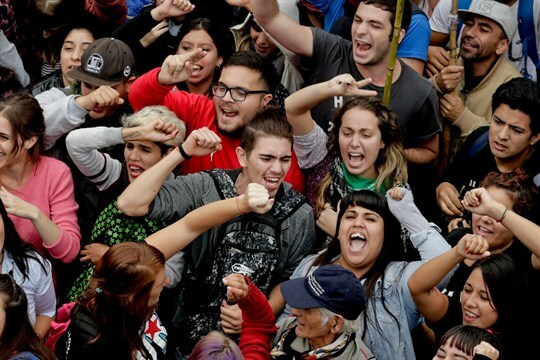 For Macri, the victory represented a much-needed public endorsement of his agenda of incremental economic reforms, known as “gradualismo.” Looking at the midterm results, some analysts and politicians practically guaranteed that Macri would be re-elected in 2019. In Argentina, however, a few months can be an eternity, and Macri is now facing a string of bad economic news, which has increased popular discontent and fired up a resurgent opposition.